I've reached one of my goals for the year with today's return. 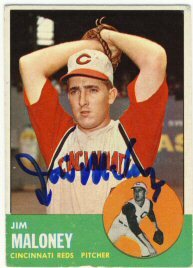 Jim Maloney signed and returned his 1963 Topps which beings my total for the year to 10, which was my goal. 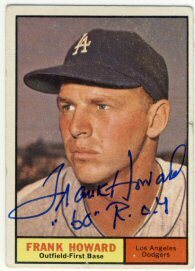 He also signed his 1972 Topps, bringing me to eight for the year, with a goal of 10 as well. Today I received a ball back signed by Ryne Sandberg that I sent just seven days ago. I included $10 cash and a blue ballpoint pen, but he signed it in sharpie. It looks nice though. This return really proved to me that I enjoy sending out vintage cards much more than newer cards. 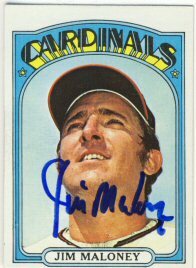 I'm just not getting fired up about my 1978 Topps set, but I enjoyed this weekend's return. 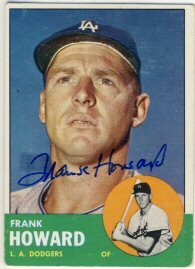 Frank Howard signed his 1961 and 1963 Topps for me, and even inscribed the 1961 with his Rookie of the Year award in 1960. I've sent just three requests in the last week, and none for a while prior to that, so I was surprised to see one of my return envelopes in the mailbox today. 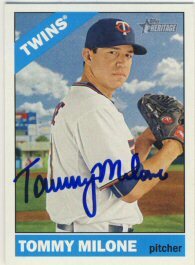 It was a request I sent back to Tommy Milone back in February to the Twins' spring training address. This is just the fourth return of the 12 I sent to the Twins back in February. I only sent to player that have a reasonable return rate and a relatively recent history of success. The other players that responded so far include Trevor May, Kennys Vargas, and Eduardo Escobar. Hopefully I get a few more back. 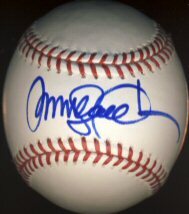 Alex Meyer and Oswaldo Arcia have been traded, so I'm guessing I won't get either of those back. 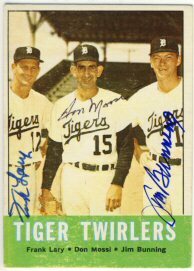 Jim Bunning provided the last signature needed to finish off my 1963 Topps Tiger Twirlers card, already signed by Don Mossi and Frank Lary. I haven't bee motivated enough to send out any requests lately. I"M pretty sure I'll miss my goals for the year quite badly.